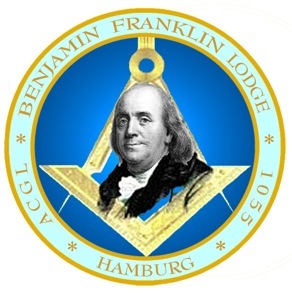 Welcome to the Benjamin Franklin Lodge #1055, which works under the jurisdiction of the American Canadian Grand Lodge and within the United Grand Lodges of Germany. Within these pages you will find information about the Lodge, our aims, our history and Freemasonry in general, both in Germany and throughout the world. Benjamin Franklin Lodge is an English-language Lodge which meets once a month, on the first Tuesday except during the summer vacation, at Welckerstraße 8 in 20354 Hamburg. Whilst English is the working language of the Lodge and it is constituted under the American Canadian Grand Lodge, the members come from many different areas and cultures, and encompass a wide range of life-styles, beliefs and experience in all age groups. Meetings are announced on the Announcements page, and the Worshipful Master of the Lodge is always pleased to welcome Masonic visitors. For men of Good Standing who are considering entering the Fraternity, Benjamin Franklin Lodge offers a wide and interesting variety of events where, as a guest, questions may be posed, information gained, and Masonry, among other subjects, openly discussed. Initial contact may be gained through the Contact Page. Photographic Credit: Speicherstadt Hamburg by Night by Marcus Jaschke.